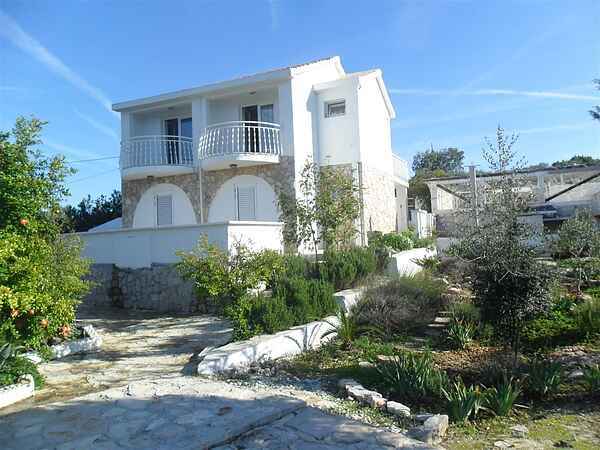 Villa Lida is located 250 m from the sea and 500 m from the place Drvenik on the island of Drvenik Veliki. The Villa is a beautiful house with rustic furniture, it has garden with mediterranean flowers, its extending on a private estate of 500 m2. The entire surface area of the estate is surrounded with a wall providing maximum privacy to its visitors. The Villa consists of 4 bedrooms, 3 bathrooms (two bedrooms have its own bathroom),1 toilet, kitchen, living room, atrium, balcony and terrace. It is suitable for the accommodation of 8 persons. Two bedrooms are equipped with beds 160x200 and cupboards. Another two bedrooms have a special entry from the garden, they are equipped with beds of 180x200, cupboards and commodes. Villa Lida is equipped with: AC, astellite LCD TV, Wi-Fi system, cooking stove, range-hood, refrigerator side by side with ice and cold water, microwave, dishwasher, washing machine, iron and ironing board, hair-driers, barbecue, terrace and balcony with the sea view. Private parking is provided with the estate for 2 cars. Drvenik Veli is a small island of Trogir archipelago 7NM away from the old town. It is extremely attractive because of its isolated beaches and crystal clear blue Mediterranean Sea, perfect for diving, boating or just resting. The island is connected with the town of Trogir by a regular ferry boat up to 3 times a day during whole year. The ferry port in Trogir is 5km from the Split airport (5 min by car). There is an organised bus transportation from the airport to Trogir. Situated close to the town of Trogir, the town-monument under UNESCO protection, and far from the city noise makes it an ideal place to relax and enjoy the sea, sunshine and tranquillity. It is also easy to organize trips to visit Split. During your stay, you will find this location is perfect for spending your days at the nearby beaches and resting in the tranquility of its pristine nature.